Town Plan at the Packhorse Fair: this is what you told us! Two hundred and sixty-two people visited the Town Plan stand at the Packhorse Fair, leaving 120 comments on Post-it notes for the Town Plan Steering Group to digest. We are extremely grateful for the time and trouble that people took, and it was encouraging that there was no negativity. We will be using the comments to help develop our October residents’ survey. You can read more about the Town Plan on the Town Plan page. If you want to add your own comment you can use the comments box at the very bottom of this page (a long way down) or email plan@brutontowncouncil.gov.uk. In either case we are unlikely to be able to respond to individual comments, but we will record them and take them into account as we develop the plan. Speeding and parking stood out as the two most commonly mentioned issues. Thirteen of the fourteen people who mentioned speeding wanted speed reduced (sometimes in specific locations, such as Dropping Lane and Frome Road) but one person thought that “20 is not plenty, keep it at 30”. The need for better enforcement of speed limits was mentioned by five people. Parking was also mentioned by fourteen people and is clearly a very significant issue for the town. There were, however, more varied views than there were for speeding: “start charging for parking”; “absolutely do not start charging for parking”; “stop town centre car parking”; “build a car park” and “over-zealous traffic wardens” are some examples of the comments we received. Three other issues were each mentioned by eight people: dog poo/the need for more poo bins; noise from the recent Gilcombe Farm festival and a desire to see the public toilets re-opened. 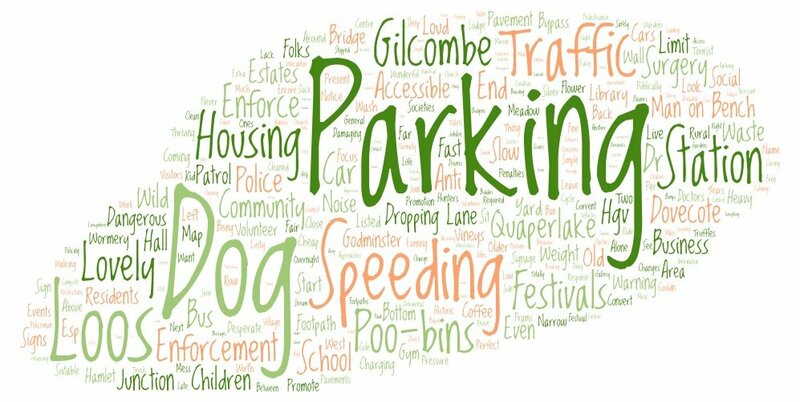 Dog poo was no surprise as it is constant concern and source of complaints, but the strength of feeling about Gilcombe Farm and the public toilets was less expected. Other matters mentioned by several people were new housing (four for, two against), narrow pavements (five mentions), please keep Man on Bench (four), don’t move the surgery (four). Three people thought it would be good if the Dovecote was illuminated at night. A full record of the comments follows below. Build a ByPass to take away heavy traffic, or our roads will collapse! You’d be lucky [to get 20 mph], traffic at standstill up High Street as it is. Parking – Packhorse Fair!! Street only cleaned one side. Town needs more parking. Calming traffic from under railway bridge to Budgens. Coaches parking at bus stop – not good place for bus stop. Enforce speed limits! Enforce truck weight limits! Right of Way at the end of the High Street? If you want more visitors to Town, open the public loos! Couldn’t sleep 2 nights in a row, unacceptable noise. INCESSANT anti-social noise generated by Gilcombe Farm Festival, totally unfair and unacceptable! I love Bruton, very friendly! General parking and lack of Police just on patrol. Lived here 6 years, NEVER seen a policeman on patrol. Don’t move the Dr’s surgery out of town. No more “wild” flowers. Riverside walk looks a mess for much more of the year than it looks good! Dropping lane is in desperate need of an enforced speed limit. The sooner the better following yet another accident this week! The festivals are only two weekends a year, some of us locals both enjoy going to them and do feel a financial benefit from them.